The fast-declining prestige of the map’s coherence or indeed its continued authority is mourned in the iconoclastic excision of both nations from the nostalgic five-color map: if the map is a signal of consensus, and of a political consensus about engaging geopolitical questions, the cartographical iconoclasm of the destruction of the five-color map raises pressing questions–and poses multiple uncertainties about future geopolitics not yet known. For the false populism of both elections raises questions of the evacuation of the authority of world maps in the UK and USA, and the consensus on their shared centrality in the world. For both nations have seemingly decisively abandoned the centrality held since World War II. The ca campaign of Donald Trump argued the centrality of the US in a complex world had come to be too costly to continue to bear, and perhaps unseemly for one country alone, much on the manner taht Brexiteers had earlier complained about the obligations Britain had gained within the EU. The increasingly unclear bearings on the geopolitical world contrast with the sharp color-saturated tones of the original Rand McNally map, as the lifting of both countries from the map, as if decals, suggest the flimsiness of a fixed perspective on the world and in so doing leave one speechless at the empty image of deep dark blue that remains where both countries once lay on the map. 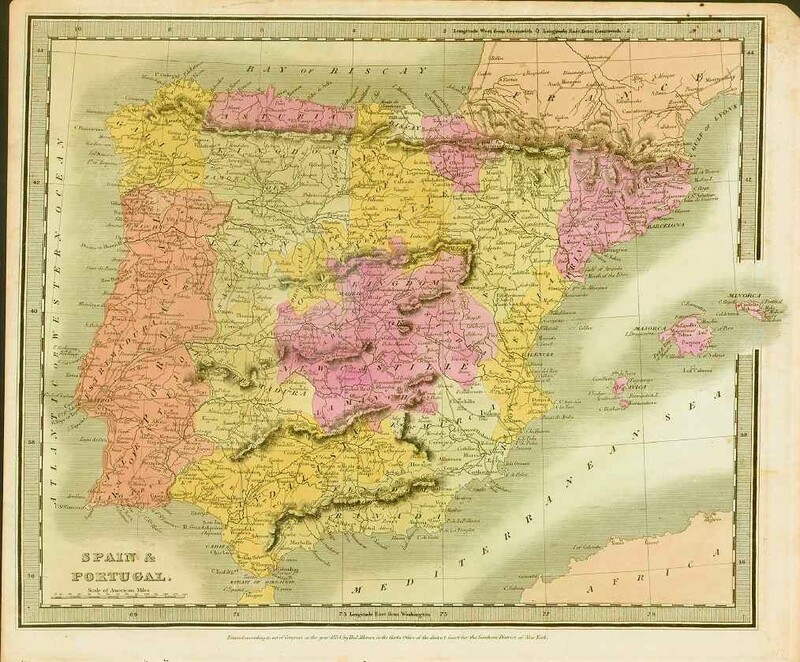 –Brazil was coded by pink to key its tie to Portugal to viewers of most early modern maps, tied by its color to the sovereign state that had staked colonial ownership, as were Portuguese possessions in Africa. The coding by color compensated for a spatially removed sovereignty–much as the nineteenth-century as the Portuguese “Map rosa” and its precedents, drawn at the same time the continent was carved up to render the false cartographical continuity of Angola and Mozambique subject to Portuguese sovereignty. The Salazar government wanted to trumpet the grandiloquence of Portugal as an Empire, the notion of an American empire seems at its end. This raises questions of what it would mean for a nation of global prominence to abandon global prominence that it had. 1. Whereas the distinct color differences contrast individual states lay on a map, the subtraction of two states that had become primary poles of global and international politics for four generations–Britain and the United States–is difficult to map, save by the deconstruction of the familiar geopolitical map. The excision of one of two of the spaces occupied by colors in the Cattelan and Ferrari image seems, in this optic, a saying goodbye to sovereignty and the sovereign entity of the state, as two major players on the world stage come to subtract themselves from the very conventions of statehood by which a globalized game was played, as if to open up new spaces of the unknown at a moment when we had all expected that the world was pretty much completely mapped. One cannot turn the page on globalization or enter a time-machine of isolationism. But the evocation of outdated mapping techniques–if not the rejection of the central position by which we have for so long misleadingly mapped the privileged place of the United States in the world with unwarranted over-confidence–is captured by the peeling back of the formerly central place of the United States and Britain in a world map. Maurizio Cattelan Pier Paolo Ferrari cunningly used the antiquated five color globe that had once defined the political mosaic of the world and the integrity of the geopolitical map to say goodbye to the hegemony of the printed map in a particularly nostalgic way. For while the level of isolationism that both Brexit and the possibility of a Trump administration stand to bring provide a more dangerous isolationism than we have ever been accustomed to–one enforced, potentially, in America, by a presumed Pax Americana that defined the global order. The likelihood of the subtraction of the United States from climate change accords, international alliances, and support for an expanded NATO or regional tariff accords, suggest fears of the permanence of the geopolitical map. As the victories of Brexit and Donald Trump are slowly processed, the upturned verso of the cut-up excised from North America, cleanly severed from Mexico and Canada by metal scissors, and of Britain, cut out of Europe, both cast distinctly melancholic shadows on the world’s surface as it is mapped–as if saying goodbye to as a past order whose two major powers seemingly subtracted themselves from an accustomed vision of the world’s geopolitical map. The antiquated cartographical medium, once organized by a Mercator projection, provides more than a metaphor for the overturning of an old geopolitical order. The benefits of such severance for residents of either Britain or the United States are not likely to be evident or to ever appear, but the absence of both from the geopolitical map will be clearly felt by all, as what had long represented a democratic order and has been rejected by parties who have cast an international order as against the interests of what is “ordinary,” “real” and “decent,” in a rebuke to the institutions of a “global power structure” that Americans and English governments had long sponsored and helped to set up in what once constituted an apparently enduring global political order. Indeed, while many of members of the Trump campaign insist that the press was mistaken in engaging the promises and slogans of Trump as literal–“You guys took everything that Donald Trump said so literally,” crowed Corey Lewandowski of the election; “The American people didn’t. 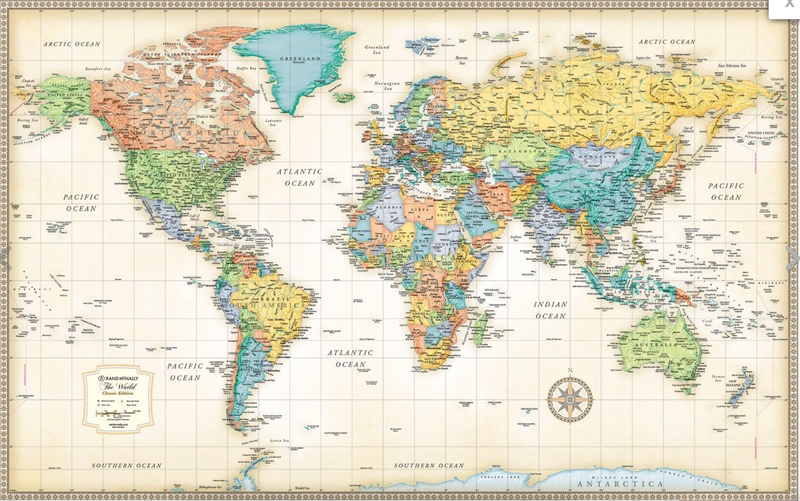 They understood it.”–the altered map pointedly poses the question of what the remapping of global order will be. For the map shows the difficulty by which the new global order can be clearly embodied. In an era of online mapping, the course to the recognizable color-scheme of a printed map seems out of place–a jarring contrast to the media by which we have mapped the unexpected but widespread appeal to apparently discounted shares of the British and American electorates of apparently separatist movements. The scissor-weilding anonymous white man who has so cleanly cut both America and England cut themselves off from global geopolitics symbolically maps a fantasy of a surgical excision from a four-color map designating national difference, and poses the problem and proposition of what it will look like to map a world where their position seems for now to be redefined, and a blank absence seems to be taking their place. Indeed, the increased presence of “filter bubbles” in nations where trust in media has so considerably eroded suggests a sort of new isolationism has been created on the limited access we have both to differing opinions and to actual news. What better tools than a such five-color map of political discontinuities for Maurizio Cattelan and Pier Paolo Ferrari to employ to represent the one-two sucker punch of the surprising withdrawal from international contracts and treaties that seem to define 2016? 2. The security Rand McNally gazetteers long provided for global orientation from the late nineteenth century is called into question by votes that swung surprisingly to rather radical extremes. Both Brexit and the election of Donald J. Trump were increasingly presented as almost inevitable referendums on the importance of envisioning the nation in a global context–and revising the relation of the nation to the world that the map publishers had instilled among schoolchildren, teachers and travelers from the 1870s. The withdrawal of England from the EU was an election that in many ways was a rejection of the status quo of involvement in the international community that was less clear outside the capital of London and other cities, and the vote for Trump in surprising majorities by once unionized workers in the United States was a reflection of their lack of tie to a sense of civic space or a sense of individual or collective progress. But it’s indeed increasingly difficult to orient oneself to the votes opting for isolationism, and for breaking away from a role long defined by urban elites, and to chose a disconnect from the complexity of global issues which are in themselves hard to understand. This seems a bit of a problem for a nation which prided itself as continuous with its past– especially for two nations that, if one can still imagine times before Brexit and Donald Trump’s apparent election, were once eager to wear the moral authority of the past. And in an era when we need something strong to take our minds off what’s going on, where the idea of getting in a time-machine to fast forward four years seems potentially attractive, the possible future of a world defined by isolationism, not internationalism, invite uncertainty about the future–if not a sense of the “end of History”–and from the image of a politically and ethically interconnected world more than much we’ve recently seen. The absence of America from that once-stable globe seems perhaps as expressive as anything to suggest the sense of standing at a precipice of the future of such a world-picture. The simple work of scissors cut off America and Britain from the world, after all, that nicely echoes what seem increasingly diminished hopes of orienting oneself to the present; they convey the hollowness more disorienting than the spun globe Matthew Pillsbury employed to communicate global chaos and ask viewers to gauge “the speed at which it is changing“–in ways that raised the stakes of just how clearly the contents of a globe could capture the complexity of current events that were both highly intertwined and widely distributed across space. Perhaps the question is now how to map the consequences of the America First movement that the campaign of Donald Trump, as orchestrated by Steve Bannon, has begun, and what point of orientation to the world–post-Brexit and post-Trump–we might find. 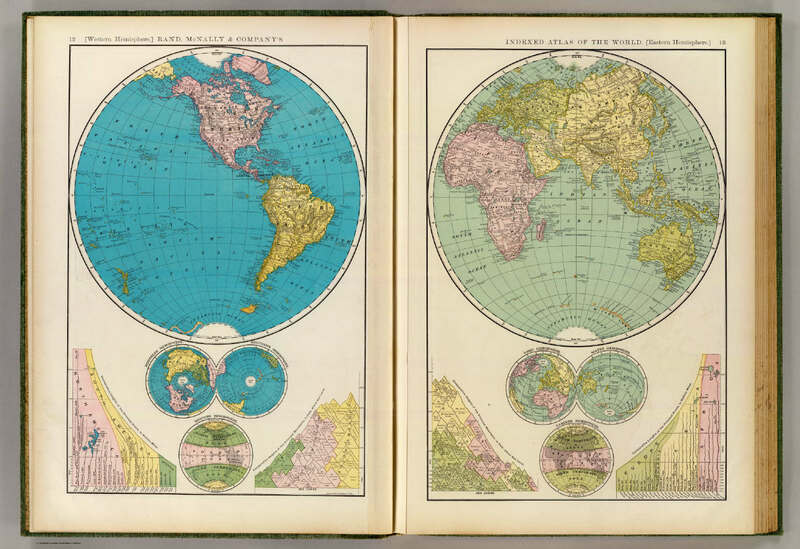 –which the prominence of the northern hemisphere in the Mercator projection helpfully generalized. 3. Such maps provide perfect foils to suggest the lack of confidence in gauging geopolitical stability or our own positions seems to have reflected the increased hiving off of news communities and separatist groups–perhaps, but only perhaps, due to Russian sponsorship of secessionist groups and to foment European secessionist movements as Brexit or anti-globalist ones, extending to the active encouragement of both America’s and Europe’s far-right–which communication technology has allowed. For the wide rejection of global connections, and ready acceptance of building bigger frontiers, seems sadly home-grown. The country has now been cut out cleanly from the North American by a clearly caucasian and apparently male hand. But the intersection of political power and the map is the explicit focus of the Magazine cover. 4. How has this change occurred? The permissiveness of bias and bigotry in everyday attacks seem unleashed in part by the affirmation of rage that occurred after the election of Donald J. Trump. But the emptying of a public space for meaningful political participation seems to have predated the elections of 2016, and the frustration of desiring to rebuke the status quo of governments that seemed increasingly disconnected from the day to day suggested the diffusion of a new politics of dispute and an absence of the possibility for normal political dialogue or action. In part, “Fake News” and twitterfeeds form self-enclosed filter bubbles and information filters around an individual intake of information in England, Italy, France, Germany and the United States that may seem under the radar. But the model of online consumption inflects what passes as public opinion that evade mapping; they depend on loops of recycling information by self-created filters that don’t know recognized geographical bounds, but remove a subject from a broader informational web: the web-based guardians or watchmen of the information overload have come to filter what we know. The creation of such filters of broad news has not only decreased the exchange of opposed viewpoints, but stands poised to create a homogeneity and ability of mass mobilization that seems corrosive of civic space, and seems especially removed from former spatial categories. –we’ve return in late 2016 to defining the status quo ante by a negative, and the subtraction of the order of a flat paper map. The image, even in an age of big data, seems particularly apt to illustrate a new sense of lacking orientation to the unfolding geopolitical framework. 6. While we were beset by maps that sought to explain the outcomes and geographical distributions of the votes in former bastions of traditions of jurisprudence–England and America–and national identity; for in the recent votes, both nations seemed to cleave or buck urban opinion, as they split along lines that one can only consider somewhat populist. Voters seemed to define themselves negatively in relation an order other than the national interest. And the cut-out maps from old atlases that once depicted the firm boundary lines in four-color format for Rand McNally seem to capture the sense of standing at a precipice, no longer knowing what exactly it means to exclude oneself from earlier conventions–as if to dismantle the very symbolic importance of an inherited map and its symbolism. Was there a distinct danger in so often looking at and mapping the ways that the votes might fall during the overlong election that seems poised to lead to the inauguration of a President Trump? The odd sense of a lack of a center of gravity or indeed point of orientation after the shock of the American elections of 2016. In large part because of the electorate’s increased over-exposure to polls–and impatience with them–their accuracy may decline. But in both the Brexit and Trump races–to name them after the winning party of each, if unfairly–the notion of withdrawal from government as is, from international treaties and accords, and from big government may have encouraged a rejection of the polling apparatus that was increasingly identified with urban elites. If Billy Bean seemed to be able to use data to predict line-ups for the Oakland A’s in 2002 to organize a team with runners on base, the models were themselves rejected by the electorate. And the considerable disconnect between voters and our ability to read them seems echoed in the weirdly upturned surface, exposure of a blank indigo beneath in Cattelan’s more recent Times magazine cover, as if to suggest an id that lies beneath the decorum of the map, where the fifty states are no longer visible by boundaries, but lack any differentiation at all. Where will this opening of a doorway lead? Does only a blue emptiness remain? Not quite. The vacant spaces on the map–this time not the unexplored regions or the areas occupied by government programs hidden from public view, but a new place of self-selected disconnect–suggest we’ve just suddenly cut ourselves out of the map, and somehow lost a sense of embodiment in a mosaic of nations, and that the retreat of Britain from the EU will move the United States even farther from Europe at a time when mutual cooperation is even more of the essence. The peeling away of the place of the United States suggests both its impermanence and the radical reimagining of a global imaginary that seems to be on the horizon in a Trump administration. And if we are not alone in doing so by any means, we are only about to see the consequences of how that places us in a world that we once knew. The departure of any sense that Anglo-American traditions provide a basis for global orientation are as antiquated as the map from which Cattelan worked, but the crisp boundaries that defined clear borders and their capitals remain as a lost imaginary that seems to have receded in time. For now, we are condemned to accept where the cards will fall, wherever they may, as “taking back one’s country” seems equated by subtracting oneself from a global order that a near- or apparent majority just doesn’t want anything to do with any more. For in rejecting the super-national entities that constructed the New World Order of globalism–EU; NAFTA; NATO; UN; IMF–and a “global power structure” that many voters feel disenfranchised by. The “new Right” that takes direction from strong men who are often ethnically divisive and emblematic of a heteronormative order seem to recall the stability of a five-color map or a Mercator projection, but they are advocating cutting out the prominent place of England or America from that map, and returning them to a politics of self-interest. How long this false populism can prevail is unclear. How to map the present sense of lack of order save by absence isn’t so clear as the distance from a map where the geopolitical picture was evident seems increasingly clear.